We are very different than any of our competitors and the details below explain how we grade our raw material. The method we use for grading our wood flooring is unique to us and more selective than the industry standard. There are BS standards for grading timber which is BS EN 942 and numerous others. However having worked with Architects, Designers and Developers for more than 10 years we have developed our own system for different species and this document explains how we grade and select the raw material prior to production. Although we are very particular when selecting raw material it must always be remembered that trees are individual just like us. The colour variation, knots and grain is very dependent on the weather and other factors during a growing season. The nutrients taken in by the tree such as iron oxides and other local geographical properties in the soil will have a big impact on how the tree matures. As mentioned there are over 600 different species of Oak which have matured across the Globe. Generally we talk about Red Oak, White Oak and European Oak. European Oak generally grows faster than the white Oaks of the very northern forests of Russia and North America including Canada. Hard Maple comes from the very north regions of Canada. We only use prime Maple raw material because when growing, Maple will collect iron oxides and other nutrients into its structure as well as having effects from pests, which can turn out to be black streaks and other defects in the wood fiber also the heart wood at the middle of the tree is always reddish as below. 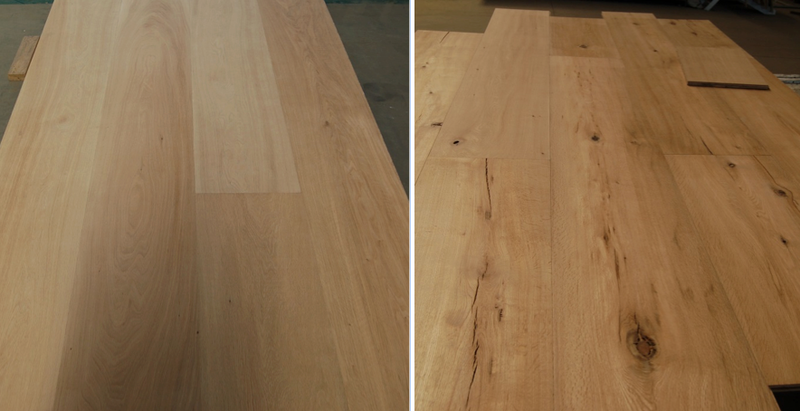 The picture to the right shows the boards cut from a single tree we will only use the first two (1 & 2) boards to manufacture our Prime Hard Canadian Maple Engineered Flooring. Sometimes we will include board 3 but the rest with mineral defects we use elsewhere. Commercial names: Virginia Walnut (UK); Walnut (USA). Other names: Canaletto, Black Hickory Nut, Canadian Walnut, Walnut Tree ; We use all of the walnut raw material we get as it is a limited resource for legally harvested timber. This means there will be knots, burls and swirly grain. The heartwood is a rich dark brown to purplish-black, and we cut out the majority of the very white sapwood to keep a warm rich colour throughout our Walnut Flooring. The picture below shows the sort of effect you will get with our walnut flooring. The little white streak is the small amount of sap wood you will get which is less than most suppliers. White Oak raw material comes in grades from A to F. A grade is very straight and uniform with no colour variation; to F where there are “shakes” and “splits at the end and large dead knots that have fallen out and a large variation in colour. As we manufacture all our own wood flooring we are able to select out very carefully the raw material in the following grades. Not only do we select out according to the size of the knots we also select the colour variation, using the darker coloured raw material for our darker coloured oiled, fumed and carbonized boards and the consistent light colours for our select grade wood flooring. We use the CDEF grades for our antique wood flooring and heritage darker oak boards to ensure we use all our raw material. We grade our American and Russian White Oak as follows and the price will depend on the grade, finish, length and width and thickness of the board and top layer, AB grade is the most expensive, with normal CDE grade the least expensive. White Oak from the northern regions of North America North Asia and Siberia in Russia grow very slowly so grain and colour variation is more regular and cleaner than European Oak which grows much faster. It also has a lot less knots than European Oak, for example our Select ABC grade would be like a prime European Oak grade or “Grade 1” as we call it. This shows the colour variation in an ABCD mix grade which has been fumed (left). Above you can see an ABCD oiled board (Right). European Oak is a different species than white oak even though people say they have white European oak it will always be darker and we select out in two grades as below. Due to the nature of the raw material it is general smaller and has a lot more knots and colour variation that Russian and American White Oak. Most of our products on the web site will show a picture of it fitted but always remember even though we are very selective in our grading wood is a natural product and will always have its own character and ambience no matter how careful we are.